We have had a rainy week (now snowing), so I only have inside pictures of an already darker quilt. 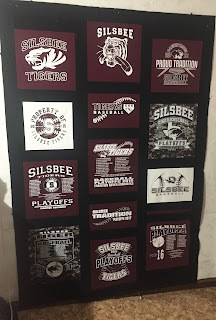 A high school graduation gift - my first T-Shirt quilt. 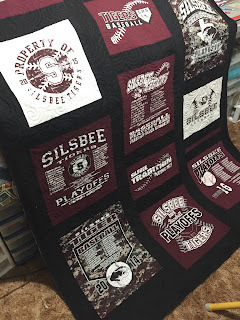 I made a couple of practice blocks with old T-Shirts...so glad I did. To those who make the T-Shirt Quilts for a living-- bless you! Loaded on the long arm and basted the whole quilt first, then went back and quilted in a circular pattern. And....here it is fresh off the long arm frame. I am hoping for a picture (outside) when presented to my great nephew. Linking up with Sarah at Confessions of a Fabric Addict. Nice job, Janice! I've got several bags of shirts from the girls' teen years that I need to do something with. . . Did you interface your shirts first? What did you use? I just cut the shirts apart for my first T-shirt quilt. I'm liking your idea of using an old shirt for practice first. Yours turned out great! What a great quilt! You did good!! Whoop whoop!! Great job on your first T-Quilt!! !